Palestinian haggadist of the fourth century, contemporary of R. Levi. Commenting on Cant. iii. 1, R. Levi observes: "The congregation of Israel says to the Holy One—blessed be He!—'Lord of the Universe! In the past Thou wert wont to grant me intervals of light between nights; thus there was such an interval between the night I had spent in Egypt and the night I spent in Babylon, between that night and the one of Media [persecution of Haman], and between the Median and the Grecian nights, and between the Grecian and the Roman nights; but in these present times—naught but nights!'" Thereupon R. Alexandra says, "Yea, because I am asleep, neglectful of the study of Thy Law and the observance of Thy commandments, nights follow nights" (Cant. R. to l.c.). It is chronologically possible that this R. Alexandra is identical with R. Alexandra of ẒadoḲa, of whom R. Zeira I. sought legal advice (Yer. Dem. ii. 22c); they stand, however, too isolated to allow of identification with each other or with Alexandri. 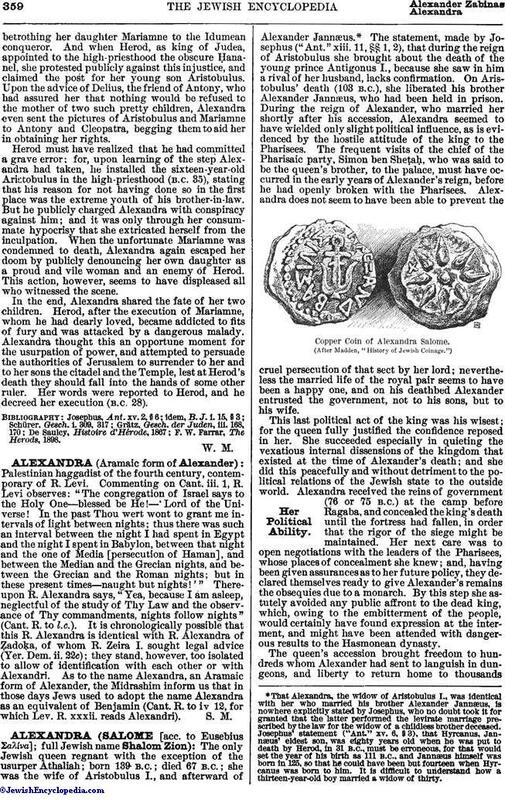 As to the name Alexandra, an Aramaic form of Alexander, the Midrashim inform us that in those days Jews used to adopt the name Alexandra as an equivalent of Benjamin (Cant. R. to iv. 12, for which Lev. R. xxxii. reads Alexandri).